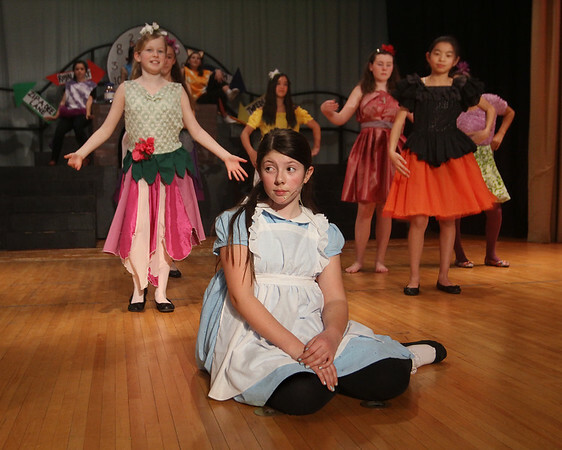 Seventh grader Asha Egmont, who plays Small Alice, rehearses a scene with other cast members Monday from the musical "Alice in Wonderland Jr." at O'Maley Middle School in Gloucester. In the middle background are the Flowers, from left: seventh grader Meagan Gallo, seventh grader Lila Olson (partially hidden), sixth grader Emma Duckworth, sixth grader Julia Amero, seventh grader Lila Hawks and (partially hidden) seventh grader Sophia Hogan-Lopez. On the platform in the far background are Cheshire Cat narrators, from left, seventh graders Kevyn Chandler and Sabella Curcuru.